Cows, Corn & Country ... these are three words that I've grown up around, three words that I use to take for granted and now I consider them to be three words that I wouldn't know what to do without! The reason for this post though isn't to talk about the feedlot in my backyard, the spring planting, or the beautiful place I live! Cows, Corn & Country is actually the name of a blog I follow ... Well okay the full name of the blog is Cows, Corn & Country Girls and the author/writer is a fellow NDSU Alum and friend Jaime May Purfeerst. Even though I haven't seen her in two years I still feel that sense of 'social media' connection haha. Jamie is a communication major like myself and what comm girl doesn't love all the different social media outlets?! I've been following Cows, Corn & Country Girls for a while now and love everything Jamie has to blog about ... farming in MN isn't that different than here in good ole' ND (her husband even raises Black Angus)! Jamie just had a birthday and in celebration she is having a Giveaway on her blog!! See Picture below ... a homemade key fob made by the lovely CCC girl herself, maybe I forgot to mention she is super crafty!! 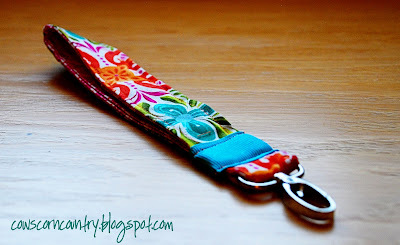 So go now and check out her blog, follow her and sign yourself up to win this one of a kind Key Fob!